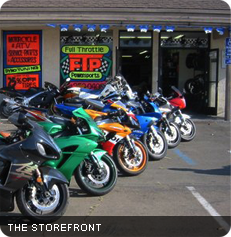 FULL TROTTLE POWER SPORTS RACING is the Premier Motorcycle Repair in San Diego. We also work on scooters, watercraft such as Jet Ski and Wave Runners.with fast turn around times. From Basic tune up to major tune up. We do it all. We are supporters of District 38 desert racing and can help with preperations for your next street bike track day. We have an on site DYNO and can tune your street bike, dirt bike, cruiser or ATV to its peak performance. We also offer Super Moto conversion services. Everything from forks to brake upgrades. We have an inventory of brakes, chains, sprockets & carry all the popular brands of tires for sport bike to cruiser as well as dirt bike tires; Dunlop, Michelin to name a few. We also carry an assortment of motorcycle gear, helmets, jackets & more and deal with the biggest distributors such as Parts Unlimited, Tucker Rockey, and.Drag Specialties. If we don't have it we can get it fast. We are full service shop offering parts, services and accessories in San Diego since 2005. Our professional motorcycle repair technicians are here to help you with any repairs your bike may need; from oil changes to major motorcycle engine repair services. If you need parts or accessories we carry many major brands in stock, but if we don't have it in we can usually get in 1-3 business days. We also offer in house welding and machining services.